Our copper quadruple toggle switch is the epitome of industrial style. This rebellious tarnished copper plate refuses to conform to light switch conventions – it’s just a little bit wicked. We’ve done our best to capture the beauty of these sockets in the photos, however, the finish of each one is unique and may differ from that shown. Having said that, they do all age with use to look less ‘new’ and more ‘industrial’. Each of our distressed copper plates is unique, with swirling iridescent tones of blue, teal and grey tarnishing the surface. 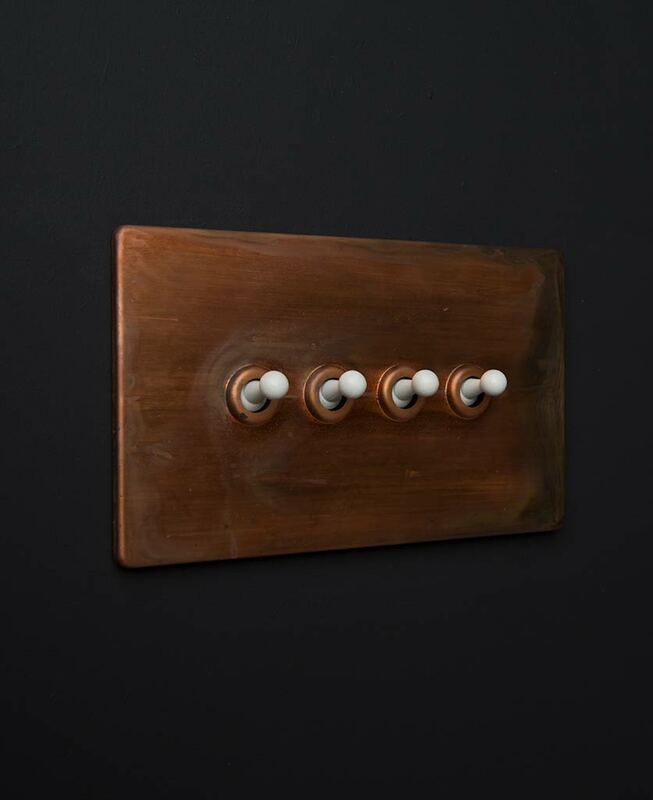 The retro toggles contrast the weathered plate beautifully, an uber-stylish way to turn your lights on and off. 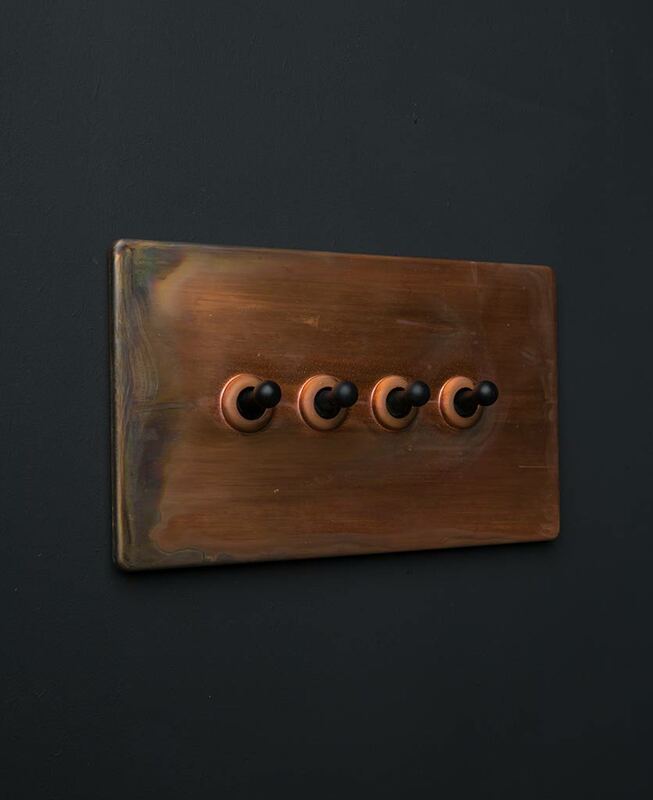 Our copper quadruple toggle switch features a distressed copper plate and fabulously retro metal toggles. Each of our switches, dimmers and toggles have been exclusively created to fit flush to your wall for a sleek and minimalist finish. They also have concealed fittings and are LED compatible. What more could you want from a light switch? We love the tarnished finish of this copper plate. It’s just so inherently industrial, the perfect rugged accompaniment for a rustic interior. The weathered tones that sweep across the surface are just stunning and add texture to a range of styles. Make a rebellious statement by placing on pure white walls. This striking switch just craves attention. 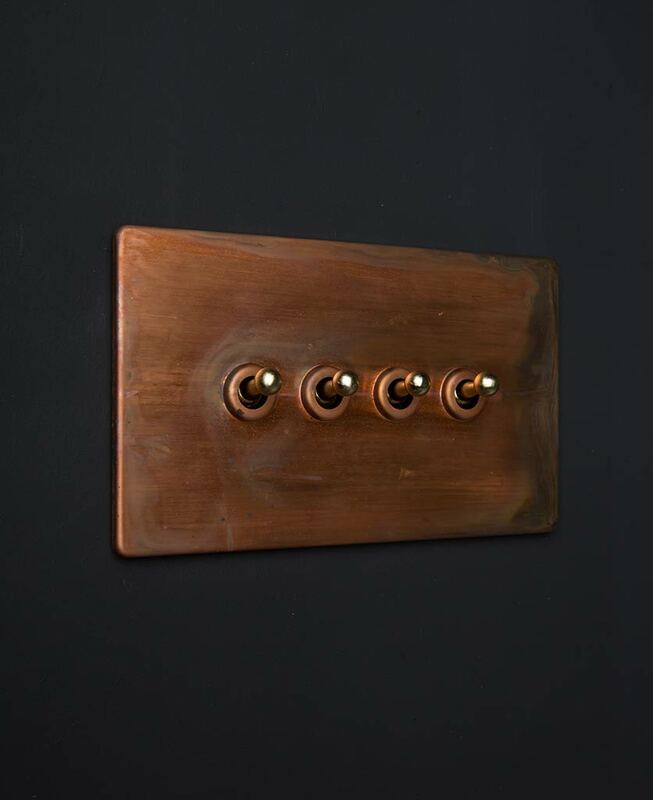 This industrial toggle switch is part of our tarnished copper switches and dimmers range. Coordinate this collection of unique toggle, USB and appliance switches to accentuate an industrially designed interior. A stylish way to banish archaic and unsightly white plastic fittings.